Now point to where the Future is. And now point to where the Past is. Now imagine the past and the future connected by a line. Does any part of that line run through your body? 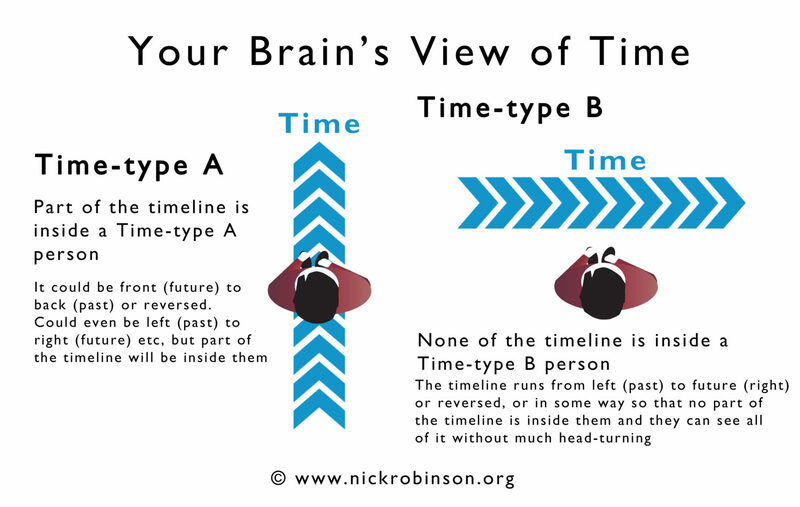 If you answered “Yes”, and part of the timeline is inside you, you may be a Time-type A person (see diagram above). If you answered “No” and no part of the timeline is inside you (see diagram above), you may be a Time-type B person. The way our brains perceive, sort and use time can be quite different for different people. As with all of this stuff, there’s no ‘good’ or ‘bad’ way of looking at time. Just differences which have varying implications. Similarly, this way of perceiving and sorting time is just a ‘preference’ – that is, it’s not a fixed and immutable aspect of who you are, it can develop, change and adapt over time and in different circumstances. I’ve set out below some of the key aspects of each Time-type and given some development suggestions that I typically use with my executive coaching clients. Unless they’ve worked on this (and most of my clients have) they can tend to be late and will regard even fairly big amounts of lateness as being “roughly on time”. Often find it difficult to be ‘in the moment’. First, the way they plan and set goals so that they can realistically deliver something and see it through to completion. The trick here is to deliberately and visually swing their timeline around so that it’s in front of them, just as it is for a type B person (see diagram above). Any kind of visual planning method, particularly something using ‘swim lanes’ and running from left to right seems to really help. Working backwards from the future (from right to left) having established some clear and visualised goals also helps them be realistic about what can be achieved (whether they are being overly-optimistic OR overly pessimistic). Second, their ability to take the learning from their past experiences and to fully process the emotions associated with them. This is a little harder to do without some training, but I like to use methods which draw-on Type-A people’s ability to be in the moment. Take them back to a past experience. Discover what learning was in it. Then remind them how they are now and what new resourcefulness they have now as a result. Then project that forward (“How might you usefully apply that in future?”). First, their ability to respond swiftly at work when unexpected stuff happens. What makes this hard for Type-B people to do is that they’re great at seeing how one thing connects to another and of the consequences. Trying to make sense of all this quickly in a crisis is tough. The trick seems to be to take advantage of their abilities to plan and decide BUT to drastically scale-down their frame of reference. It’s as if, in the diagram above, you had completely chopped-off the future time-line so the range of options they need to consider is now very small. Anything which brings that frame of reference as close in to the ‘now’ as possible will help. Second, their ability to enjoy themselves in the now. Simple mindfulness meditation exercises, which focus on the breath, are very useful for this if practised over time. Similarly, focusing on sensory experiences (what my American trainers would call “getting out of your head Nick”) also help. What can you see, feel, hear and smell right now? What colours are there? What are the textures? What are the different qualities of the sounds you notice? Write and tell me or tweet me @NickRobCoach to let me know which Time-type you are and whether this matches your experiences please. The standard you set becomes the standard you can expect. Whatever you regard as normal around here becomes the ‘norm’ – the benchmark for people’s behaviours and the outcomes they strive to achieve. In my experience, people want their leaders to ask for more than this. Otherwise, what’s the point in having a leader at all! Don’t you feel like this too? Like you want your leaders to see the best in you, even when you yourself don’t? That you want them to inspire you to go beyond the point you’ve always settled for previously, and help you to find out what you’re really capable of? A pace-setting leader, who sets very high standards for themselves, can come unstuck when faced with someone who doesn’t hold themselves to a high standard, or who doesn’t feel confident about being able to keep up with that leader. Those leaders don’t always know how to help someone bridge that gap. A strong, person-centred leader, someone who is highly-resilient themselves and who knows how to take care of the people around them, can be afraid of ‘breaking’ people. Instead, they try to protect them, to shield them from all the tough stuff that they themselves have to deal with. Not just in the outputs you achieve, or the pace of your work, but in your leadership style, your emotional intelligence and your own behaviours too. Different folks need different strokes. Learn what makes the individuals in your care tick. Learn their fears, learn their ambitions. Modify your approach to suit their needs. Relationships are the oil in the engine, the glue that binds a team together (and any number of other mixed metaphors). Build relationships. That means a two-way flow of attention, care and trust. 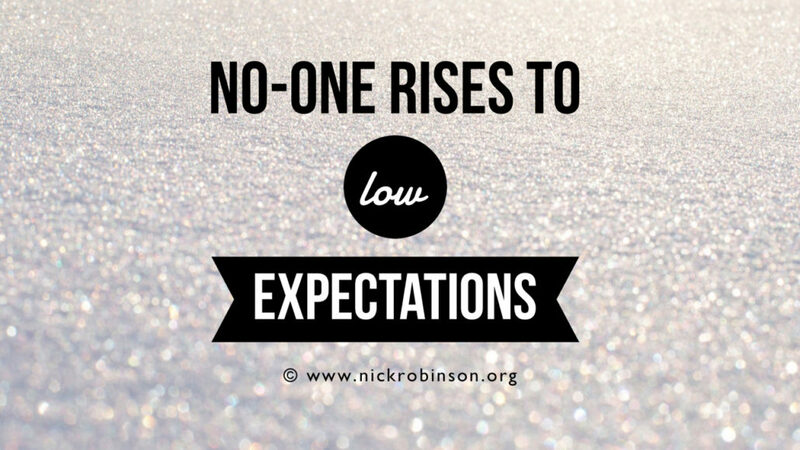 You can set high expectations for people without having a great relationship. And it’ll work for a while (especially if they’re afraid enough and if the task is simple enough). But in the long-run, great relationships are a must-have for getting people to raise their game. So long as you manage the risks and learn from the outcomes. I often quote Batman to leaders who are worried about people failing. Of falling down and hurting themselves. “Why do we fall down Bruce? If you never ask someone to risk falling, they’ll never learn to rise up. Sometimes we forget the simple stage of asking. And then we get annoyed that people can’t mind-read. Ask people to raise their game. Tell them what you need from them. I’ve been thinking again recently about what it takes to get into that “Sweet Spot” – the point where you’re feeling right on top of your game, totally in the moment and like you’re actually making a difference. There’s lots of things involved in achieving this it seems and those who are really interested could do worse than read the book “Flow” by Mihaly Csikszentmihalyi. Although I actually found this to be an ultimately slightly frustrating book, because it concludes, more or less, that you can’t actually ‘achieve’ a flow-state, it’s something that just happens to you. And that isn’t really good enough for the control freak in me! Seeing as I have a great laboratory in my coaching practice, and clients who are crazy and willing enough to play around with this stuff, I’ve been looking at two of the dimensions that I reckon might required to get into that Sweet Spot. Have a go with these yourself if you’re up for some experimenting, and let me know if it helps you find your own Sweet Spot. It’s my experience that one of the best ways to regard this, is to think in terms of familiarity. That is, the extent to which you’ve been there and done that – or not. Studies have shown that being too comfortable means we don’t build up or maintain the resilience required to handle life and work. I’m calling this the ‘nilstress’ position. At the other end of the scale, is the ‘distress’ position, where we’re so far out of our comfort zones, that our challenges are not able to be resolved through coping or adaptation. This may lead to anxiety, withdrawal, and depressive behavior. In the middle, is the point that psychologist Hans Selye labelled ‘Eustress‘ – ‘Good Stress’. This occurs when we’re slightly pushed out of our comfort zones, but are not overwhelmed by it. Our goals are familiar enough but still require us to stretch. This fosters challenge and motivation and is indicated by hope and active engagement. (But note that even good stress which carries on for too long, i.e. is ‘chronic’, can be damaging to people’s health). Chunksize refers to the size of tasks or goals you’re working on. As much as anything, it’s about how you measure or perceive that you’re making progress. Set your Chunksize too small, and it feels like you’re crawling along, never actually getting anywhere, and just forced to work on things that are Meaningless and don’t make a difference. Set your Chunksize too big, and every task, goal or problem just becomes totally overwhelming. If you’re stuck at this end, it may be you’ve developed a nasty case of Meaningitis! In the middle there is the point we want to get to. At this Meaningful point, our tasks and goals are broken down into a size where we can see that we’re making progress. And where we can predict with a reasonable amount of certainty how much time and effort it’ll take to achieve our next objective. If you can manage to put all of this together, then it might just be that you’ve hit the Sweet Spot. You’ve got challenges that take you far enough out of your comfort zone to be slightly unfamiliar and that require you to stretch. And you’ve got a chunksize set just right, so that you can see and predict how you’re making meaningful progress. I hope you get a chance to play around with these two dimensions. Please drop me a line to let me know what you find, even (or especially) if your experience is different to mine! As your career and your leadership roles progress, how should your Time Management evolve to keep up? I had a very interesting coaching session this afternoon, talking with one of my clients about his time management. Time management isn’t one of those subjects that comes up so often in my coaching sessions these days, I think because I’m more often asked to work on the less tangible but more transformational issues that help people be the best possible version of themselves as a leader. But I still feel it’s an important topic for people to look at. I used to run a workshop called “Creating Time”, designed for professional people who wanted to make more of themselves and their efforts at work. My opening gambit was that it isn’t actually (yet!) possible to create time and that we must instead focus on those issues around attention-control, decision-making and task-management that are part of great time management. the number of people you answer to actually increases, as more and more stakeholders become affected by things you are responsible for. All of this puts a great deal of demand on your time management skills and process – so they need to evolve to keep up. What worked for you as a junior manager might not be so useful as a senior leader. These days, I’m a big believer that one person’s great Time Management System is another person’s admin nightmare. What works for me, might be really counter-productive for you. I really like David Allen’s Getting Things Done (GTD) approach and I’ve been using it since 2015. But, it has a really steep learning curve and requires at least a couple of dedicated days (if not more) to implement. It also needs constant attention and discipline. And, of course GTD is a task-management system, not a time-management one. Great time-management also requires those additional aspects of attention-control and decision-making I mentioned earlier. On the whole, I think people should experiment with their own systems and adapt them to suit their own circumstances and preferences. 1. Do you feel in control? If not, then you need to change part of your system so that you can clearly see where you need to take control. 2. Is your brain clear, rested and able to create solutions and face tough decisions? There are two aspects to this, I reckon. First (and I think this is from David Allen’s book) your brain shouldn’t be your main tool for remembering stuff. 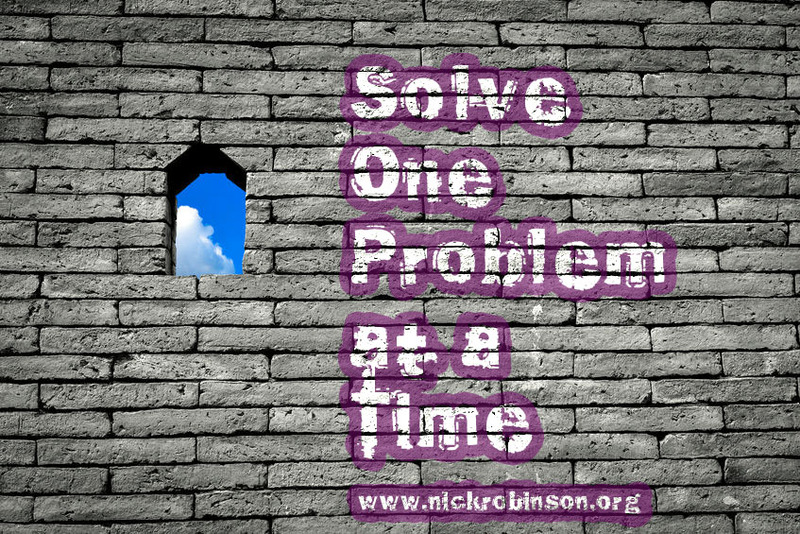 It’s the best thing you’ve got for finding solutions and making decisions. Use some other system for remembering stuff. Second, if part of your schedule doesn’t include time for you to be healthy, happy and whole, you’ll be operating at way below maximum potential – and who wants to function like that!? 3. 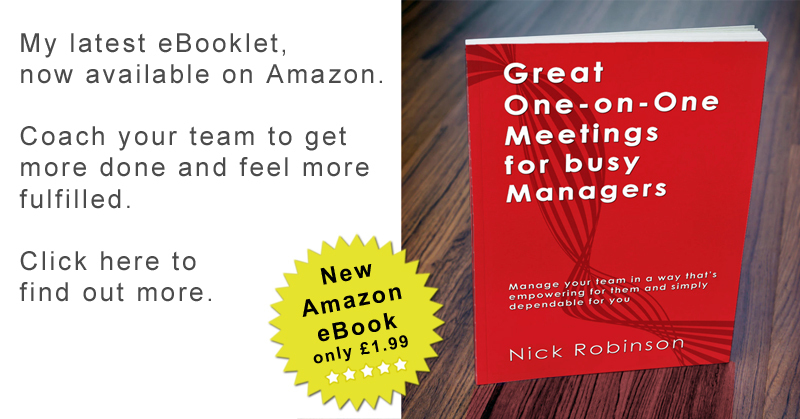 Do you have one place, one reference point, that captures ALL of your to-do’s? I know some systems don’t advocate this, but it’s one point I strongly recommend. Those of us who are responsible, can-do people, who want to make a difference and be at our best, should not be spending any of our attention or our ‘worry-quota’ on wondering if there’s something we’ve forgotten. 4. Do you consciously know what you’ve decided NOT to do? This is kind of a follow-on point from 3. Having some certainty that you know everything that needs doing, can enable you to focus on what leaders should be focussing on – deciding what gets done and what doesn’t. 5. Does your system help you decide in what Sequence to do things? For some people, sequence comes quite naturally. Actually, for about 40% of the working population, it’s one of the first things that comes to mind when deciding priorities. People who are natural sequencers need a system that allows them to work with this transparently, but which also takes into account importance – because of course the first thing that could be done isn’t necessarily the first thing that should be done. People whose natural preference is not to work in sequence (and that’s also about 40% of the working population) need systems that give them a bit more flexibility, so that they don’t feel the time management system itself has ended-up railroading all their decisions. 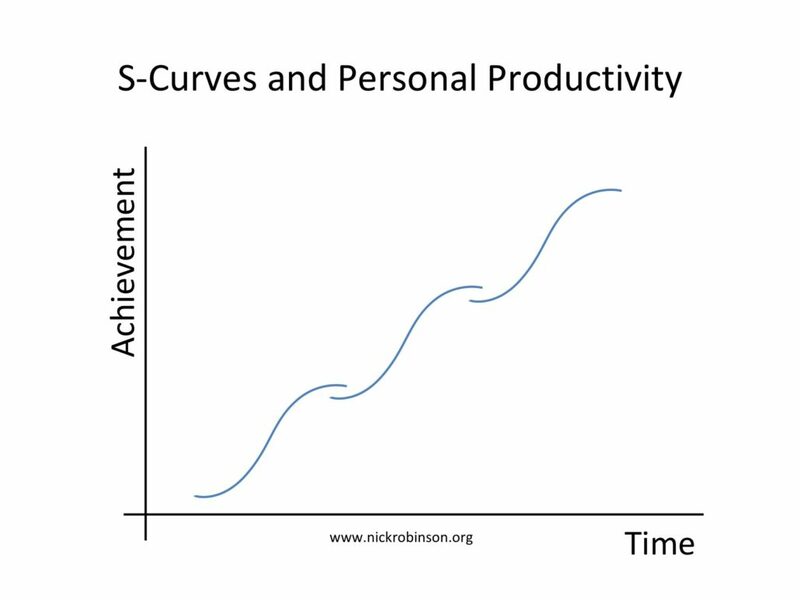 I personally feel that this is where a lot of time management falls down, forcing people to work in ways which run counter to their natural strengths. 6. Does your system support your oversight of other people’s activities? I know leaders in very senior positions who have responsibility for up to 20 other people – who themselves are leading teams too. These are big spans of control. When I’ve been in similar situations, I’ve actually really enjoyed the buzz of it, of being at the service of those people, making sure that they can do what they need to do. And I think it’s a powerful way to make a difference. And, you soon find that you need some kind of system which helps you see progress on some important tasks, but which also helps you coach, guide and support those people. The rise of Objectives and Key Results (OKRs) as a way of doing this is part of an organisational response to these issues that goes back over 20 years. Bottom-line – choose a system which supports your style of leadership, in your circumstances. 7. 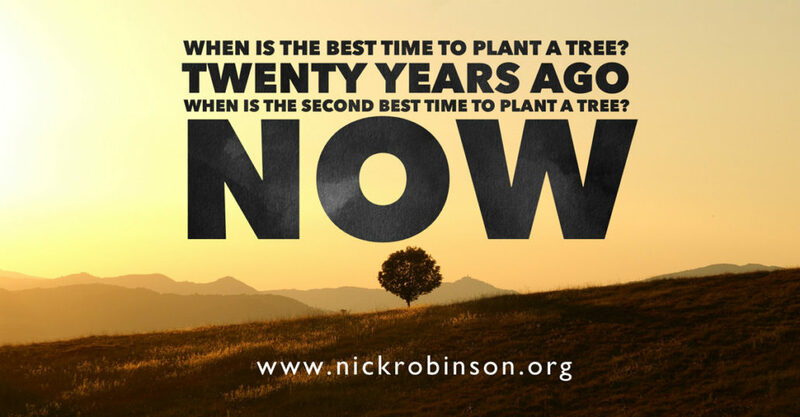 Do you have a way for deciding what task is most deserving of your attention right now? And does that way of prioritising actually get the results that you want – if not, how might you need to change it? 8. Do you have ways of controlling your attention? This is absolutely essential if you want to get the most out of your problem-solving and higher-cognitive functions. The distractions caused by email and other forms of interruptions will steal your day out from under your nose if you let them. Please find structures and ways of doing things that don’t have you working on some kind of knee-jerk autopilot, pulled all over the place by less important interruptions. 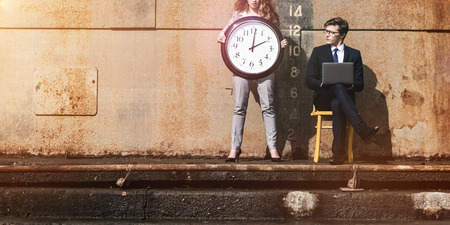 I’m sure we just scratched the surface of how your time management systems need to evolve as your career progresses, and of the general principles that need to support great time management. Let me know what else is important for you? As I write this, it’s mid-December and I expect some people are thinking about setting goals, objectives or even resolutions for next year. What you may not know, is that all of the great advice about setting SMART goals (Specific, Measurable, Achievable, Realistic and Time-targeted) is useless for about half of the population. It used to be that psychologists would talk about Type A and Type B people. But if we put that Type A and Type B research to one side, I think we can say that there are some people who are naturally organised, who like to plan ahead and who tend to think in step-by-step procedures. Doing goal-setting work with these people is almost too easy. Then there’s the other half of the population, people who tend to think creatively, who like to dip in and out of many projects, and who love doing things their way, even if nobody else does it like that. “Leonardo wrote copious notes and intended to publish several treatises, but, like many of his artistic projects, these were never finished”. Unless you know that this approach already works for you, or are feeling really, really happy and relieved at the thought of getting all organised and writing numbered lists, with deadlines etc, let it go. If you absolutely can’t let it go (perhaps because you work for a Type A person or have HR people in your company who feel more comfortable with boxes on forms), then I’m afraid you will need to game the system as best you can, but make sure you do the following stuff too, as this is where your strengths really are. Do you like to scribble in notebooks (you probably have more than one notebook on the go at once)? Do you think visually (you’ve probably already got into making vision-boards or scrapbooks of things you intend to try doing)? Maybe you’re a talker and like to think out loud? Whatever your method, make sure you set aside time for dreaming (call it “Visioning” if you’re at work, it sounds more official to Type A’s). It’s very important to have somewhere to ‘put’ all of your great ideas and stuff that you might work on someday. Not because it’s important that you don’t forget it. After all, ideas come relatively easy for you, like buses, there’ll be another one along in a minute. No, for you, having a Someday-Maybe file is an important way to stop your head exploding with the awesomeness of all your ideas and initiatives. There really isn’t a right or a wrong way to set goals. They are only a means to an end, a way, for some people, to drive their performance towards something important. What’s important is that you find the way that helps you to achieve what you want to achieve at work. Here’s one exercise I often use with clients who aren’t sure yet what their way is. Think about a time at work when everything was going just right for you. When you felt alive and were getting the results you wanted. What was going on around you then? What conditions were important to you for for getting those results? What was in it for you – why was that outcome important to you? You’re probably at your best when you’re like one of those circus plate-spinning acts. You’ve got loads of plates spinning on loads of poles. Some will be teetering and need your input and some will be doing fine. And some will be lurking in a corner, forgotten. As you write your version of your ‘goals’, you will need to learn to recognise when you’re about to set one too many plates spinning. If you’re a subscriber to my newsletter, you might have already seen that I’m running a series of exclusive video blogs along this theme – that failure is a really important part of progress and is actually the antidote to quitting. I think it’s also an important part of goal-setting for non-linear people. You will need to try more things than you can achieve. You will need to go down some blind alleys. Like Leonardo da Vinci, you will probably have a pile of unfinished projects. When you’re writing down whatever your version of goals for next year might be, make sure they’re listed as things to “Try”, “Experiment with”, Fail at” or “Learn about”. 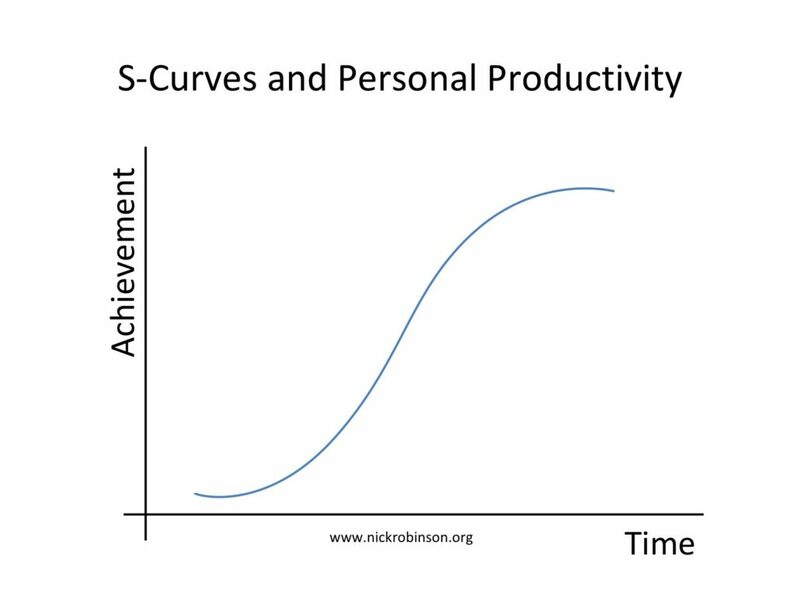 This last couple of years I’ve been getting more and more obsessed with being productive. I expect this is happening because I’m both (a) Lazy and (b) Ambitious. I just don’t see any way of combining those two (without it all ending in tears) unless I’m getting as much done with as little effort as possible. One slight warning, the following is absolutely full of spoilers. I can’t imagine anybody hasn’t seen these iconic movies yet, but if you haven’t, maybe rent them first. In sequence, obvs. Bad guy Hans Gruber and his psychotic side-kicks have taken over the Nakatomi tower on Christmas Eve. Intent on stealing the company’s millions of untraceable bearer-bonds, the only thing that stands between Hans Gruber and the certain death of the Nakatomi hostages is world-weary cop, John McClane. Barefoot McClane gets shot-at, beaten-up, rejected by the authorities and has to sprint through broken glass. His plans fail, his ammo runs out, he’s bloody, bruised and bandaged – and his white vest turns steadily dirtier and blacker. But he never, ever quits. Get knocked down seven times; Stand-up eight. Once again, we find ourselves at Christmas Eve, now at Washington Dulles Airport. This time we’re in a plot involving special forces solders trying to rescue General Ramon Esperanza, a drug lord and dictator of Val Verde, who is being extradited to the United States to stand trial on drug trafficking charges. I forget why they’re doing this; it doesn’t really matter. They’re the bad guys and John McClane is the goodie who must save estranged wife Holly and other airplane passengers from a deadly crash into the snowbound runway. Nobody can navigate their way around the byzantine layout of the airport (or the plot…), apart from our Yippee ki-yaying hero John, who has one secret weapon on his side that is a great productivity lesson for when you’re lost and can’t see your way forward. No matter how busy you are, be humble enough to take time to connect with the unseen people working away in the depths of the engine room – they know stuff that will help. This time we’re not at Christmas Eve. Never mind. A crazy bomber is threatening the city schools and John McClane must team up with shop owner Zeus Carver. The bombs are of course just a distraction, because now it’s gold that the bad guys are after. There are trucks, underground tunnels which flood, a ship, loads of explosions, and plenty of painful injuries. Thanks to the efforts of our heroes the school kids are rescued. But somehow the gold still goes missing. Most of the time, the key to being productive is about the big picture, about knowing where you’re going and focussing on that. But just sometimes, the real clues about how to reach your goals are in the tiny, easily-overlooked details. Know when to switch your focus from big-picture to detail. Now it’s cyber terrorists, because the internet has happened and national infrastructure like electricity, gas and financial stuff is all vulnerable to hacking. Hard-drinking, hard-to-get-along-with cop, John McClane, is reduced to baby-sitting assignments and has to transport a hacker who is facing criminal charges. Meanwhile, the bad guys start blowing things up and taking out anybody who can identify them. John launches a car at a helicopter, which explodes. There’s a thing called a firesale, which is about crippling the infrastructure so much that the economy collapses; John’s daughter is in peril; the bad guy turns out to be a spurned cyber-security expert who didn’t get the credit for his government work. John has to team up with the young hacker guy, because he can do that hacker-typing stuff. Oh, and there’s a VTOL jet plane (an F-35B Lightning II), which John also takes out. 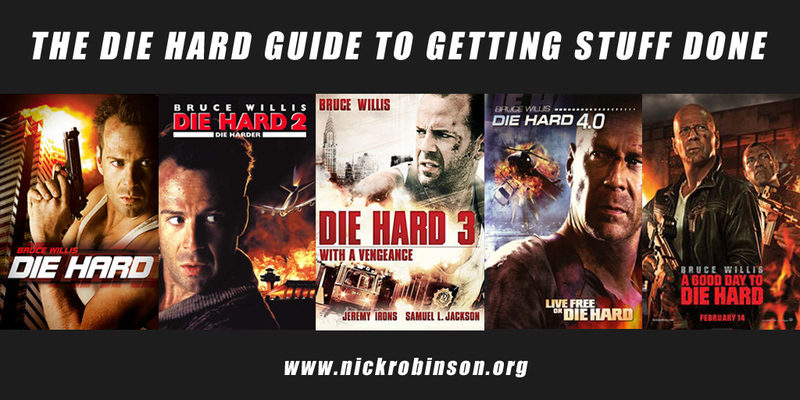 There are so many lessons about how to get stuff done in Live Free or Die Hard, that it’s tough to know where to start. You could look at how John McClane learns to trust and rely on the cyber-expertise of young hackers Matt and ‘Warlock’. McClane might not know cyber-stuff, but he knows people and he knows when to depend on them. Or you could look at how in the final scenes McClane shoots himself THROUGH HIS OWN SHOULDER to kill the bad guy behind him. That’s getting stuff done right? No pain, no gain! Sometimes, in order to get stuff done, you’ve got to totally disrupt what’s currently happening. It’s not enough to just do things right, you’ve got to be doing the right things. Nothing changes the game like launching a car at a helicopter. They didn’t see that one coming and it certainly cleared the way for the priorities that John really had to be getting on with. It turns out that John McClane’s estranged son Jack is an undercover CIA agent. Jack is facing trumped-up charges for assassination in Russia and so John travels to Moscow to help him out. Everybody’s after some kind of file concerning former billionaire and government whistleblower Yuri Komarov, which has evidence implicating high-ranking Russian official Viktor Chagarin. There are plenty of gun fights, more helicopters, running, leaping and exploding. There are also red-herrings all over the place, as the file turns out to be non-existent and is actually a clue to a secret entrance to a Chernobyl vault containing €1bn worth of weapons-grade uranium. It’s this uranium that everyone (not just the bad guys) has been betraying each other in order to reach first. A Good Day to Die Hard is a lot like trying to get stuff done in real life. You can never really be sure what’s going on. Somebody tells you that the secret file is the key, but do they really know what they’re talking about? What if they have an agenda of their own? A pivotal point in the plot is when John and Jack meet up with Komarov’s daughter, Irina. They’re in a grand hotel in the city. Irina will provide them with a key to the vault which contains the (non-existent) file. The file will exonerate both Jack and Irina’s father Komarov, as well as incriminating Chagarin. So why is Irina acting so shifty…? John McClane trusts his instincts and just knows that Irina’s shifty behaviour is not right. That her motives must somehow be off. This gives them vital seconds to escape the devastating gunfire that rips through the hotel ballroom’s windows. When you’re trying to get stuff done, people around you will promise one thing and do another. Their motives will be different from yours. Most of the time, they’re not acting against you (unless you’re John McClane), it’s just that they’ve also got an agenda, stuff that they need to get done too. Trust your instincts to know when this is happening and deal with it in as straight-forward a way as possible. Yippee ki-yay people; go get stuff done.